This project is based on traced sketches of Allen Ginsberg’s photographs made by George Schneeman for a collaboration he planned with Mr. Ginsberg. 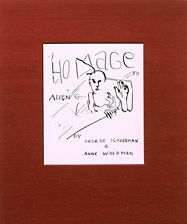 After Mr. Ginsberg’s death, Mr. Schneeman and Anne Waldman converted the tracings into this homage. The words were generated by Ms. Waldman and handwritten by Mr. Schneeman. The portfolio consists of ten collaborative works plus the colophon, housed either in a cloth-covered folder (for those printed on BFK) or a cloth-covered clamshell box (for those on Dieu Donné). Printed by Philip Gallo, letterpress from magnesium engravings. Boxes by Barbara Mauriello and Judith Ivry. Signed by Schneeman and Waldman.